All flights will be performed by FAA-licensed and DOT-registered air carriers. AURA does not operate aircraft. ZED Aerospace does not hold out any offer to engage in air transportation today. 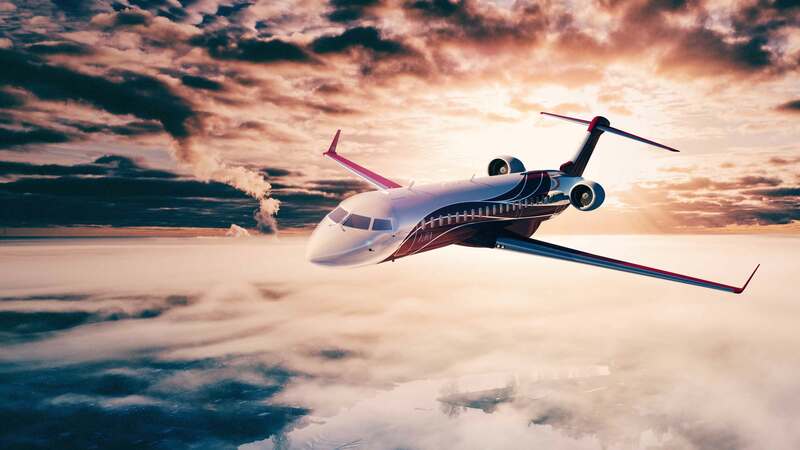 ZED Aerospace offers a newly-crafted flying experience, combining the luxury and convenience of a private jet with the affordability and reliability of an airline. To deliver on this unique vision, we upgraded 75-seat Bombardier CRJ700 aircraft to accommodate just 29 passengers. The spacious Swiss-designed interior showcases the very best of technology, design, and service. Stretch your legs in AURA’s FIRST seat which features 44in of pitch, the most legroom out of any domestic first-class cabin flying today. The OLED ceiling provides exceptionally high color rendering, ideal for replicating realistic colors, textures, and natural sunlight. Champagne service for your delight. There are 7 rows of seats in the FIRST cabin. Stream, surf, and work with complimentary high speed WiFi. First developed by ZED is unlike anything you’ve seen before. It may be in the rear cabin but it’s far beyond what commercial airlines put up front today. FIRST features the widest seats with the most legroom of any domestic first-class service in the United States. Our 20-inch wide seats provide maximum comfort and our 44-inches of pitch means you can actually cross your legs. Guests may request an iPad Pro anytime to watch a wide variety of movies and TV shows. OLED technology eliminates the uncomfortable blue light associated with artificial light discomfort. True blacks allow the OLED display to perfectly mimic a starry night sky without introducing any additional light into the cabin—black is simply black on OLED. FIRST passengers are treated to private airport service, a rotating menu of fusion tapas, SushiBar selections, and a curated list of wine, liquor, and cocktails. High-speed WiFi, a complimentary iPad Pro, and a SkyLights Virtual Reality headset are all available for use onboard. Every passenger receives a complimentary pair of noise-cancelling headphones. OLED ceiling integration delivers a magical experience that melds into the surrounding cabin. Art Deco inspiration on AURA is noticeable in the stitching on all seats, resembling hem and necklace lines from the 1920s. QI wireless charging pads are located at every seat. Traditional outlets and USB ports are also available. There are 4 spacious rows of seats in the WAVE cabin. Unconstrained by convention, ZED sets a new standard for premium air travel with WAVE. In an exclusive eight-passenger cabin designed by Swiss private jet designers, WAVE defines luxury and elegant interior design. WAVE guests may Book The Cook, custom ordering a full five-course meal prepared on board. WAVE offers a level of service exceeding that of a private jet. Float in Zero-Gravity in the AIANAWAVE Seat, designed with input from sleep psychologists and aero-medical scientists. 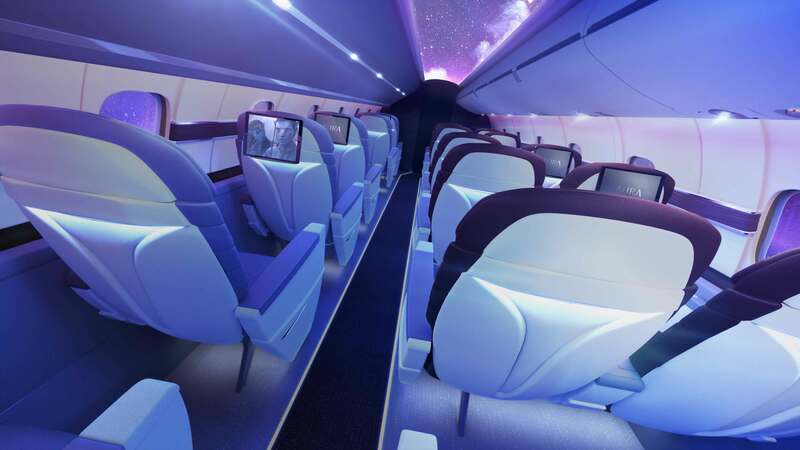 WAVE seats will have a double window in a single frame creating the largest simulated window in the sky. 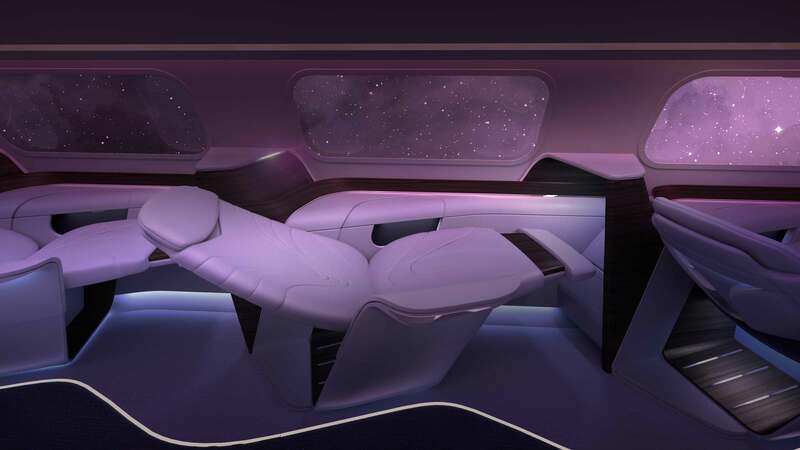 The signature WAVE cabin features the revolutionary zero-gravity AÏANAWAVE seat, designed by YASAVA Solutions with research from aero-medical sciences and sleep psychology. The seat features a mattress design of superior thickness and optimized reclines for multiple body positions that allow for better circulation, improved breathing, and a reduction of the dangers of DVT. OLED lighting has a spectral power distribution closest to natural sunlight. Enjoy marvelous sunsets, starry nights, and blue sky from the comfort of your seat. WAVE guests may request an iPad Pro anytime to watch a wide variety of movies and TV shows. Stream, surf, and work with complimentary high-speed WiFi. Flight information, points of interest, and other contextual information can be displayed in augmented reality on the OLED window. Place your shoes and other personal items in one of the many storage spaces incorporated into the WAVE seat. Pioneering OLED display technology is the most deliberate evolution in passenger experience since the introduction of simple mood-lighting in the 1990s. Transparent OLED introduces industry-first augmented reality applications, revealed on what becomes the largest window in the sky. 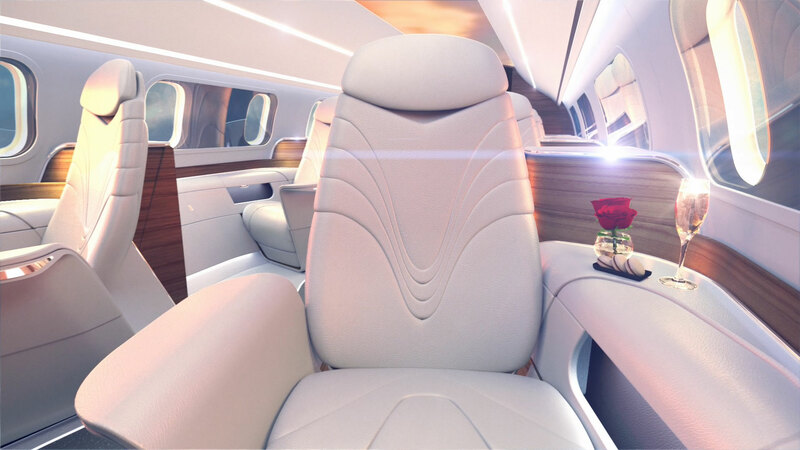 OLED ceiling integration throughout ZED Aerospace delivers a magical experience that melds into the surrounding cabin without distraction. 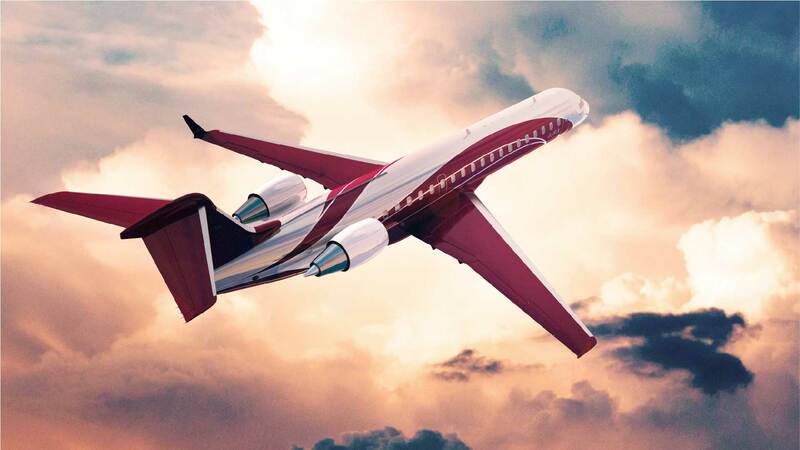 Flights offered by ZED Aerospace will be operated by Presidential Aviation, an established FAA Part 135 private jet operator with an impeccable 20+ year safety record. Presidential’s safety protocol is based on FAA and ICAO standards developed under guidance of the Air Charter Safety Foundation. Dedicated to excellence in safety, Presidential Aviation has been awarded prestigious ARGUS Gold rating and Wyvern Wingman certification. Enjoy unrivaled service with an industry-leading flight attendant-to-passenger ratio of 1:10. Flight attendants will be dedicated to the same routes on the same weekly schedule, meaning frequent fliers will recognize familiar faces. Personalize your taste profile in the app to let our staff know exactly how you wish to be served. Large airports waste your time. By departing from our private Hangar, you will save approximately two hours every time you fly. Arrive 20 minutes before departure and jump right aboard, from car to plane in a matter of minutes. Our dedicated ground crew will whisk you on-board through the private terminal entrance. No need to worry about spending long times in security lines or at baggage check, we take care of everything for you. Or take advantage of our comprehensive suite of business services available in the terminal before boarding. The perfect airport has no terminals, no concourses, no trains, no moving walkways, no gates, no jetbridge. Flights depart from private hangars separate from the cramped atmosphere of commercial airports. ZED Aerospace will offer flights from multiple airports within the same city, allowing for the utmost flexibility. Launch hangar locations are decided with input from Founding KeyHolders. The ZED Aerospace security program far exceeds TSA standards, but without any lines or personal intrusion. Our team will retrieve your luggage from the trunk of your car and assure its safe passage to your destination. All luggage is screened through international-standard security systems with advanced CT viewing technology and explosive detection. Guests are required to present a government-issued ID before boarding. ZED greatly increases business productivity, turning a two-day business trip into a one-day roundtrip you look forward to every time. Arrive at your meetings well rested and energized for the day ahead. Free valet parking, flight attendant notaries, and a full suite of business services—including in-air printing—are available to all business travelers. Frequent departures assure there’s always a flight that fits your schedule. The WAVE signature dining experience. Select a cut of beef, lamb, chicken, duck, or fish from the MEATLOCKER and we’ll prepare it to your standards on board, using precision sous vide thermal techniques. Gluten-free, Vegetarian, Vegan, Kosher, and Halal options are available on all flights. The beef is grass-fed. Never frozen. Cooked on board for you. FIRST guests are treated to a seasonal and geographically-unique menu of fusion tapas, offering a wide selection of warm dishes influenced by global cultures. From traditional Spanish tapas to Chinese dim sum and Mediterranean meze, FIRST guests will find culinary variety on every flight. Full menu and dish reservations available 24hrs before departure. 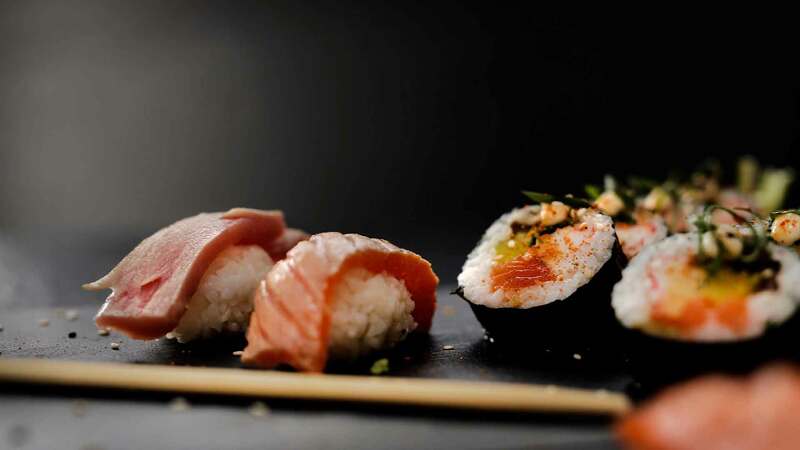 Both FIRST and WAVE guests are welcome to a daily selection of fresh sushi and sashimi on-board. The fish selection and its catch location will be available in the app prior to departure. Lift your spirits with a full bar and select the perfect wine from our rotating collection of four wines curated by our sommelier--two reds, two whites, two Old World, two New World. Coffees, teas, sodas, and fresh juices are available to all passengers. In addition, guests may enjoy Champagne, Prosecco, Port, and other top-shelf spirits. Delight in a variety of Lindt chocolates, ice cream, pies, cakes, tarts, mousse, and artisan sweets. Indulge and melt away. With complimentary high-speed WiFi, surf the web and stream your favorites on your personal device or a provided iPad Pro. Escape to your own private movie theater and enjoy the latest blockbusters, trending series and documentaries in 3D, 2D and 180° on a full HD, IMAX-style screen. 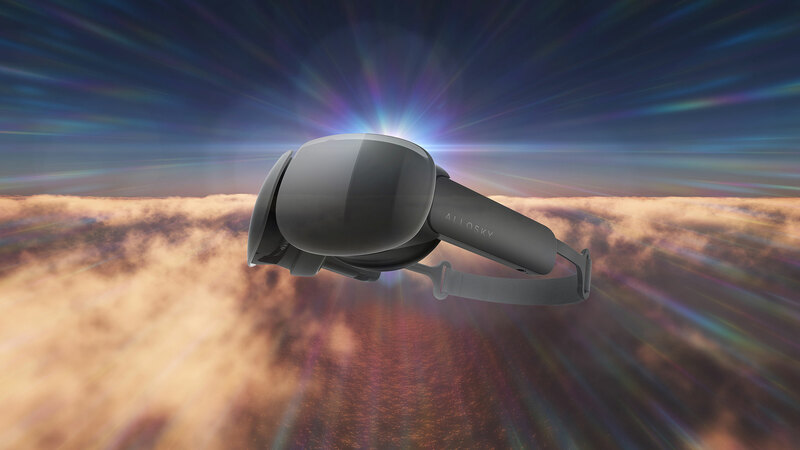 Brought to you by SkyLights, the Allosky Cinematic VR headset is the most advanced of its kind. Options include a catalog by 20th Century Fox, DreamWorks, Warner Brothers, Lionsgate, National Geographic, BBC, Baobab, and more. Put on your VR headset and sit in the The Special Seat. Mounted on top of the aircraft’s tail is a full-HD 360 degree camera streaming directly to your headset. Sit in The Special Seat anytime during the flight and feel like you are riding on top of the plane. It really is the most special seat in the sky! ZED Aerospace is developing the most hygienic aircraft in the sky. In addition to superior air filtration on every aircraft, lavatories will self-clean after every use. In only 20 seconds, nozzles positioned around the lavatory sanitize every surface, followed by ultraviolet lights killing 99% of all germs. The lavatory is quickly scented for the next guest. ZED Aerospace warmly welcomes those with disabilities aboard. Easily request special assistance, such as wheelchair service, through the app. 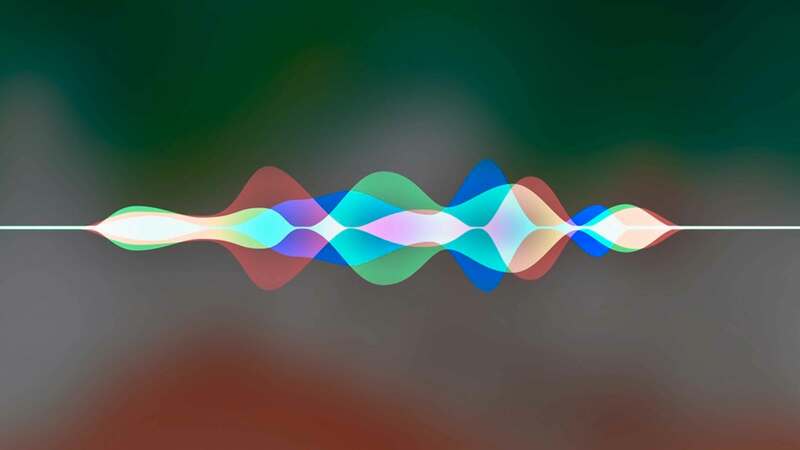 Because KeyHolders fly with fixed fares, just tell Siri where and when you want to fly. No need to compare prices or subscribe to email updates on fluctuating airline fares. ZED Aerospace flights are carbon-neutral. All fares include a full carbon footprint offset. 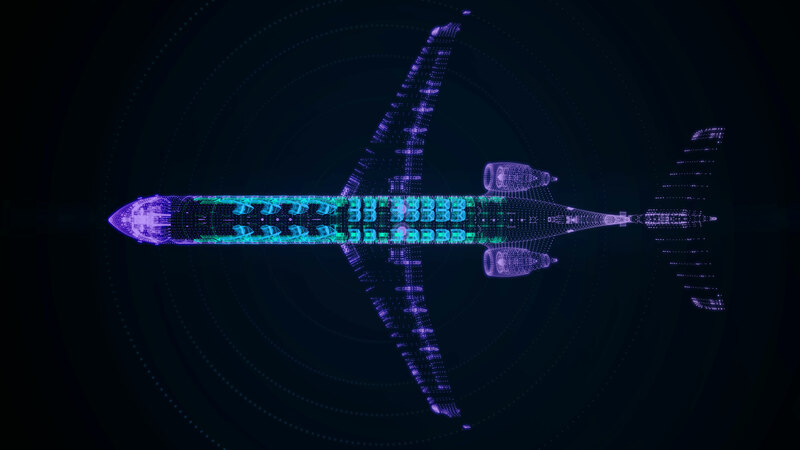 ZED Aerospace will connect North American metropolitan hubs with reliable and frequent service. To serve the demanding needs of business travelers, no city-pair is served less than twice daily, with increased frequency on busy routes. Seasonal routes will be launched throughout the year to popular ski, holiday, and event destinations. Schedules will be released every 90 days. City routes will be served year-round. As a KeyHolder you can enjoy peace of mind with fixed fares on every route - guaranteed to be our lowest price available. With one simple monthly due, you will find preferred availability, seating, and an extremely generous cancellation policy for those times when plans change. In search of ease and elegance while traveling, and fly more than three times per year? The AURA Key is right for you. Not quite ready to become a KeyHolder? No problem. Register today and join us on our path to launch in 2019! As a Guest of AURA we will keep you posted with special discounts and updates as we build out our fleet. Registering your email is the best way to stay up to speed with the latest AURA developments. Why do you usually fly domestically? How often do you fly each year? International credit card? Click here. *Your $100 payment immediately secures your FoundingKey, and the next payment begins after your first flight. There are no charges in the meantime! If you have any questions, please contact us or visit our FAQ section. Register today and join us on our path to launch in 2019! We will keep you posted with special discounts and updates as we build out our fleet. If you sign up on the waitlist by July 31st, we will honor the FoundingKey offer: A Waived $700 Initiation Fee, and a Special Rate of $100/month instead of the $250/month. Registering your email is the best way to stay up to speed with the latest AURA developments. Scroll up and down to explore all the features that AURA has to offer. "I want you to love flying as much as I do. 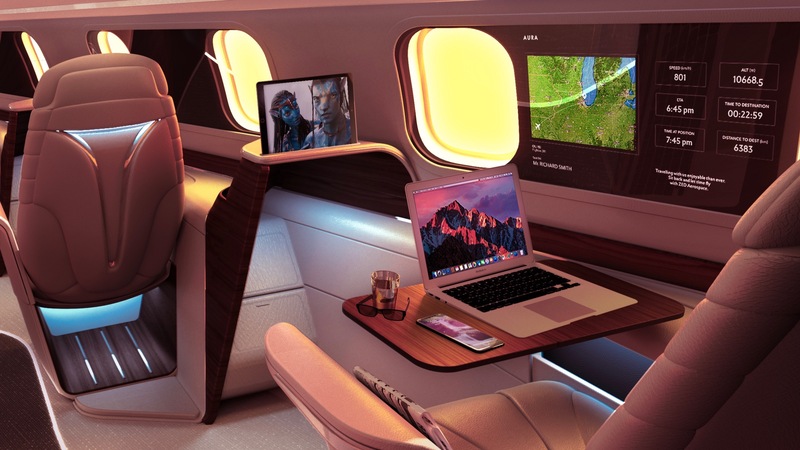 AURA is the vision of an aviation geek who wants you to reimagine what air travel can be. AURA is all about you. You can’t wait for your next flight, and I can’t wait to welcome you aboard. I founded ZED Aerospace in 2016 to create flying experiences yet unknown to the traveling public. The airlines of the United States had succeeded in their race to the bottom and I wasn’t going to let them strip away my passion. AURA is a deliberate effort to create a beautiful flying experience. No aircraft on the market today was designed for what we set out to accomplish, so we had to go design one ourselves. ZED Aerospace crafted AURA to be the most advanced fleet in the sky, unveiling the most modern technologies never before seen on aircraft. AURA isn’t about cutting corners or shaving costs, it’s about delivering an experience worthy of Five Stars. In partnership with YASAVA Solutions of Switzerland, we created an aircraft like no other. 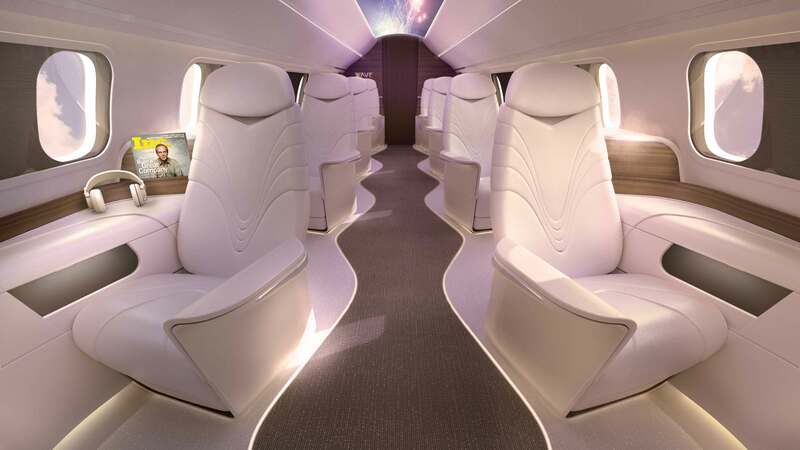 AURA is an emotive experience, arousing your senses in a way no aircraft has done before. From supple leathers to industry-first technologies showcased aboard, you know on your first step inside that AURA is game changing. Affordability was the underlying principle in developing AURA. Having flown economy my entire life, AURA needed to be a product I could afford myself. AURA is a sincere endeavor to democratize the luxury of private aviation. Gone are senselessly expensive membership fees and phony claims of affordability. AURA leads a new category in aviation where being fair and doing good are never compromised. You can expect to see me every day, in the air, serving you a glass of champagne and putting the finishing touches on your steak. I am dedicated to you, our passengers. Leading from the ground is no way to run an airline." 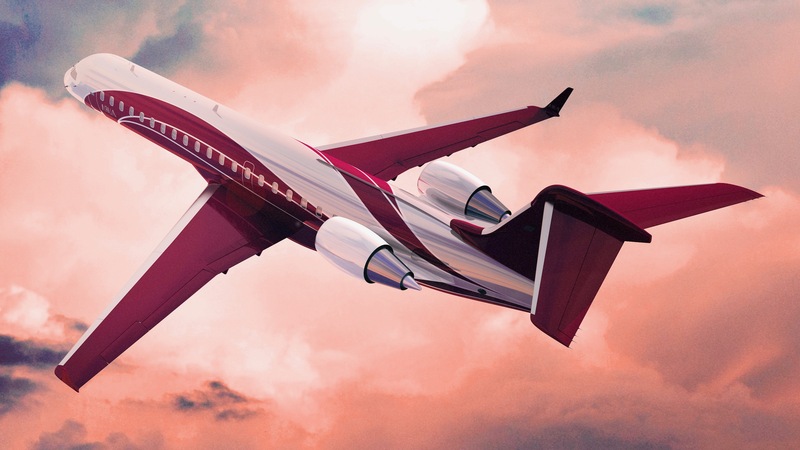 ZED Aerospace is led by a global team of individuals, drawing experience from commercial and private aviation, design, engineering, and top-level management and finance. Having flown three round the world trips on over 400 flights in the last three years alone, Zander knows air travel. With a sharp eye for design, Zander worked in partnership with YASAVA Solutions of Switzerland to develop the interior of the AURA program. Zander is adept with the United States Code of Federal Regulations pertaining to both FAA Part 121 and FAA Part 135 operations, as well as with FAA 145 repair centers. In addition to leading ZED Aerospace, Zander has consulted on numerous startup airlines, regional operators, and with foreign government agencies . A true aviation geek at heart, Zander created AURA for you. Q: Who is behind AURA? AURA is created by ZED Aerospace, backed by numerous industry experts and private investors. Headquartered in Miami, FL, ZED Aerospace develops innovative flying solutions for commercial and private aviation applications. 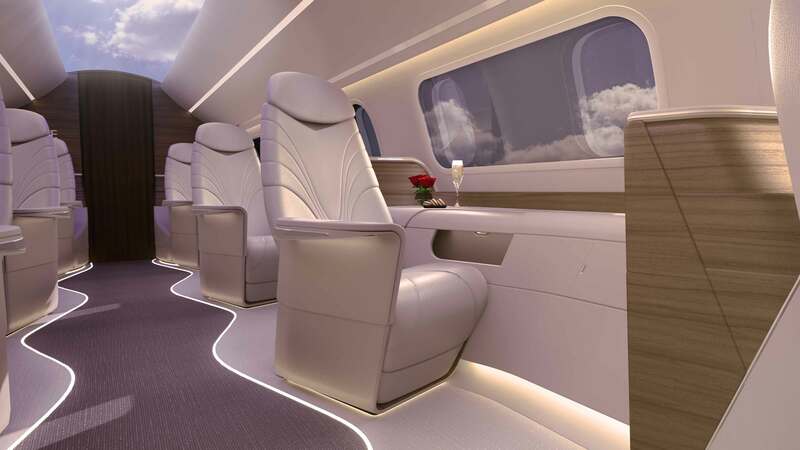 In launching AURA, ZED Aerospace positions itself as an American industry leader in crafting elegant passenger experience solutions. Q: How are ZED Aerospace and AURA related? AURA showcases the in-flight technology developed and designed by ZED Aerospace. All AURA flights will be operated by Presidential Aviation, a 20+ year old private aircraft operator Argus Gold rated and Wyvern Wingman certified. 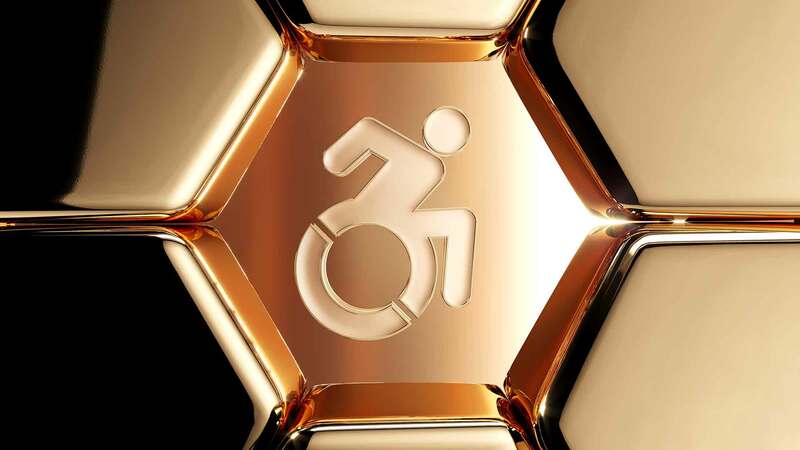 Q: Is AURA accessible for those with disabilities? ZED Aerospace warmly welcomes those with disabilities onboard. Easily request special assistance, such as wheelchair service, through the app. Q: How can you offer such good pricing? With 29 passengers onboard each aircraft, the cost of flying is distributed over more passengers compared to other private carriers, but without sacrificing space and comfort. Q: Why are you offering Founding Keys a year before launch? We’ve developed AURA to be the most exciting aircraft ever to fly American skies. AURA is built for you, and your input in the final stages of launch will assure AURA meets your needs. From helping pick initial airports in each city to attending our launch events, we hope to involve all our Founding KeyHolders in the joy of introducing AURA. 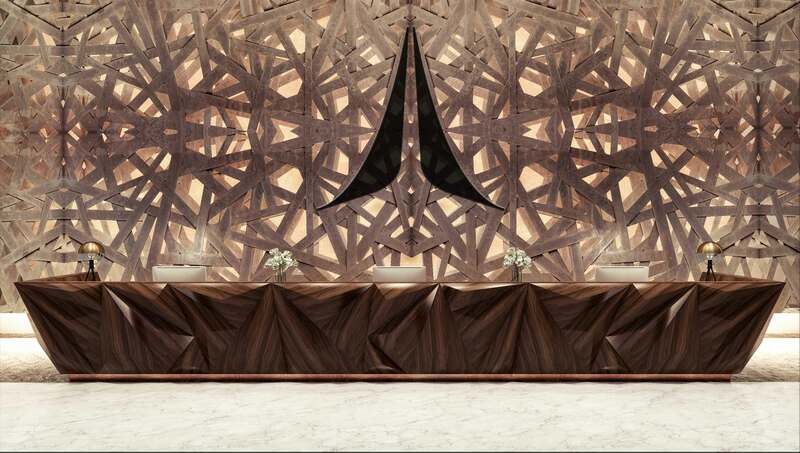 AURA is America's first five-star flight experience. 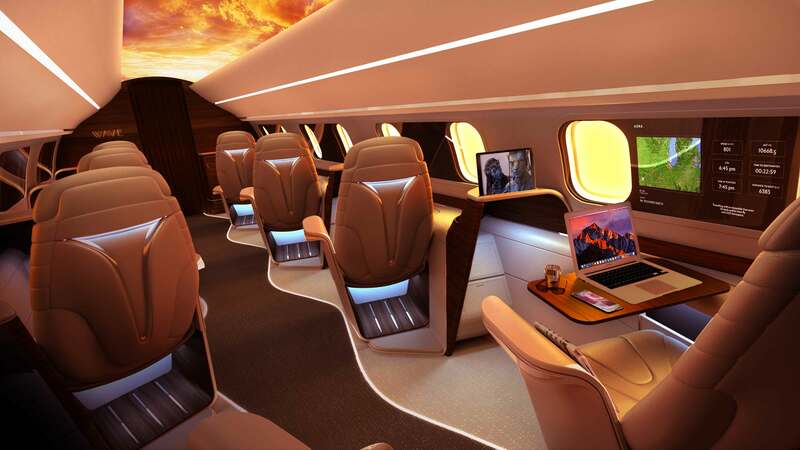 At an affordable price point, guests will experience the best of in-flight design, technology, and service all incorporated into gorgeous Swiss-designed aircraft. Q: Why should I be a Founding KeyHolder? 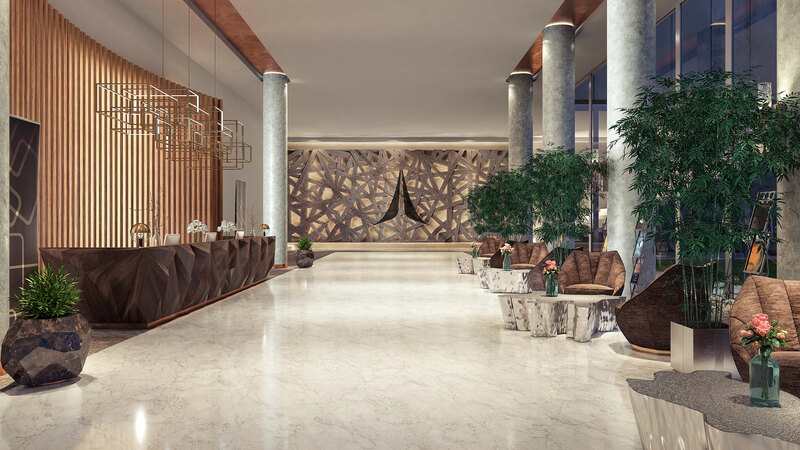 KeyHolders receive exclusive access to AURA at affordable fixed-price fares. Founding KeyHolders lock in pricing of $100/month compared to $250/month for Standard KeyHolders. You can secure your Founding Key with a payment of just $100. Monthly billing begins only after your first flight. Q: What does being a Founding KeyHolder mean? As a Founding KeyHolder you will be one of the first to experience AURA. Additionally, all Founding KeyHolders will receive the AURA Metallic Series, a collection of premium cinematic 10 x 15-inch images showcasing the AURA aircraft, printed on Kodak Endura Metallic paper. Founding KeyHolders will also receive exclusive content, updates, discounts, invitations to launch events, development surveys, and more all through the AURA portal. All Founding KeyHolders will receive an invitation to a launch Soirée in their home city. Become a Founding KeyHolder today and party with AURA! For no monthly fee, GuestCard holders receive access to the AURA flight network but at fares starting at least twice that of ‌fixed-price KeyHolder fares. GuestCard fares fluctuate dynamically based on demand. The GuestCard is designed for those who do not fly frequently. There is none! Simply sign up as a Founding KeyHolder to secure your spot and begin flying when we launch our first flight. No! You may cancel at anytime. Q: Do my kids have to be KeyHolders? If booked by an adult KeyHolder, kids 18 and under do not have to be KeyHolders to fly AURA. Q: Do you have a CorporateKey? Yes. AURA offers CorporateKeys for businesses. For more information visit our CorporateKey page. Q: Does my spouse need to be a KeyHolder? At $100/month, we’ve created the Founding KeyHolder program to be incredibly affordable. While each adult must be a KeyHolder to take advantage of AURA's fixed-fares, children under the age of 18 may fly at KeyHolder pricing when booked by an adult KeyHolder. Q: When is the first flight? AURA is scheduled to take to the air in 2019. Q: Where do I book tickets? Q: When are schedules released? Schedules are released 90 days before departure. Q: What cities does AURA fly to? AURA will connect major U.S. cities including SOUTH FLORIDA, NYC, Chicago, Atlanta, Denver, and Los Angeles with frequent service. AURA will also serve popular ski resorts, holiday destinations, and cultural events such as Sundance, SXSW, Coachella, Art Basel, and more. Q: Does AURA overbook flights? Absolutely not. 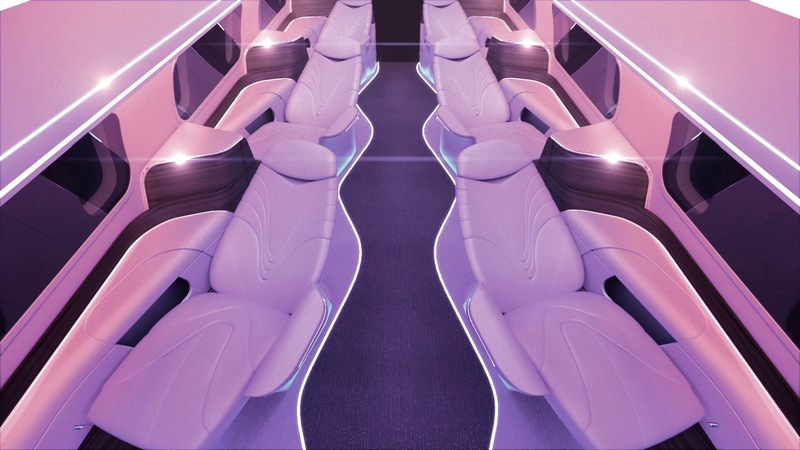 When you book on AURA, you are guaranteed a seat. If you cancel your flight over 7 days before departure you will receive a flight credit applicable for future travel worth 100% of the fare paid. A 75% flight credit will be given for cancellations within 2 to 7 days before departure, a 50% credit for cancellations 12-48hrs before departure, and a 25% credit for cancellations within 12hrs before departure. There is no fee for same-day changes. Q: Can I pick my seats? Yes. And there is no seat selection fee. Q: What is On-Peak vs Off-Peak pricing? On-Peak pricing is applied during busy travel hours such as a Monday morning flight between New York and Chicago. Off-peak pricing is applied during all other times. Q: Where do flights depart? Flights depart from our private hangar at major international airports and private airports. 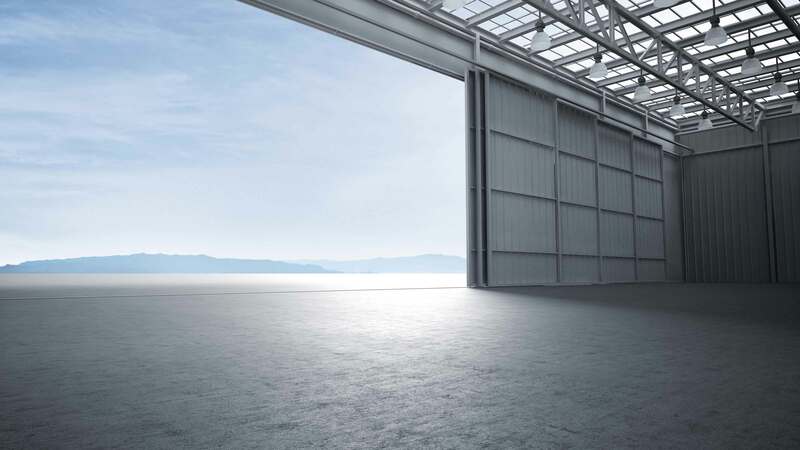 Q: What is a private hangar? A private hangar houses aircraft. AURA’s private hangar will include amenities provided by FBOs include customer lounges and a comprehensive suite of business services. Q: Which private airports do you use? Q: How long before departure do I need to arrive to the airport? Guests may arrive only 20 minutes before departure. Free valet parking will be available for same-day round trip travelers. Additionally, guests will be able to request a rideshare for pickup at the airport through the app, perfectly timing the arrival of your rideshare with the arrival of your flight. AURA will subscribe to TSA’s Twelve-Five Standard Security Program (TFSSP) which requires fingerprint and criminal background checks on all flight crew members and restricted access to the flight deck. All guests are required to show a valid government photo ID before boarding. Additionally, all luggage is screened through international-standard security systems with advanced CT viewing technology and explosive detection. FIRST guests can bring up to 120 lbs over two pieces of luggage. WAVE guests are allotted 160 lbs over three pieces. There are no baggage fees. Q: What aircraft will be flown? Bombardier CRJ-700 aircraft with 29 seats onboard. Q: How many classes of service does AURA offer? AURA offers two classes of service: FIRST and WAVE. 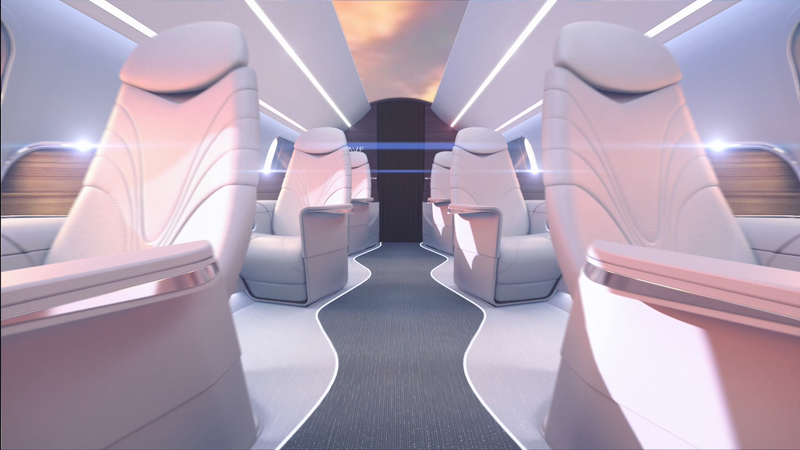 The FIRST cabin features custom seats in a 2-1 configuration boasting the most legroom of any domestic first class (44in pitch). WAVE is the pinnacle of the AURA experience featuring custom Swiss-designed zero-gravity AÏANAWAVE seats in a 1-1 configuration. Additionally, WAVE guests have access to the largest window in the sky, a layer of transparent OLED connecting two windows together. Q: What is transparent OLED technology? Transparent OLED is a dynamic display technology which serves as a platform for augmented reality. OLED displays provide an exceptionally high color rendering index (CRI), ideal for replicating realistic colors and textures. In the WAVE cabin, OLED technology joins two windows to form the largest simulated window in the sky. Q: What can I view in augmented reality (AR) on the window? A wide variety of contextual information can be overlayed in augmented reality onto the skyline including points of interest and time and distance to your destination. Of course, and it’s delicious! A rotating selection of fusion tapas and fresh fish from a curated sushi bar will be provided to all guests, with a full dining experience available for WAVE guests. 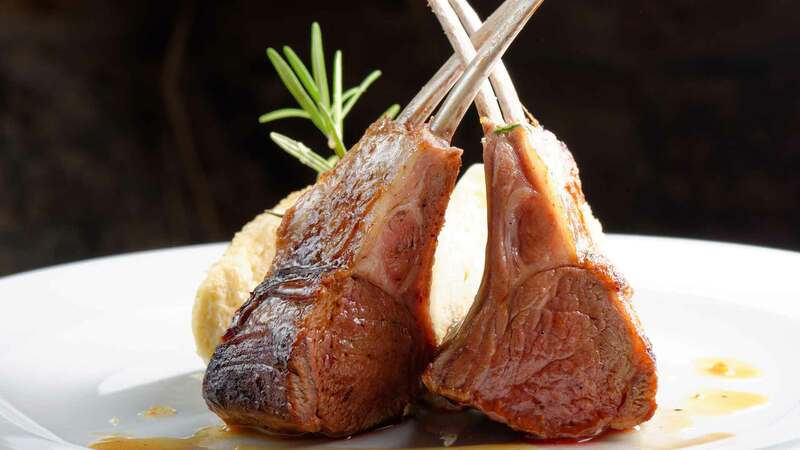 WAVE guests will be offered access to the MeatLocker 24hrs before departure, with an invitation to select a cut of meat, poultry, or fish, to be cooked and prepared on-board using sous-vide technology. 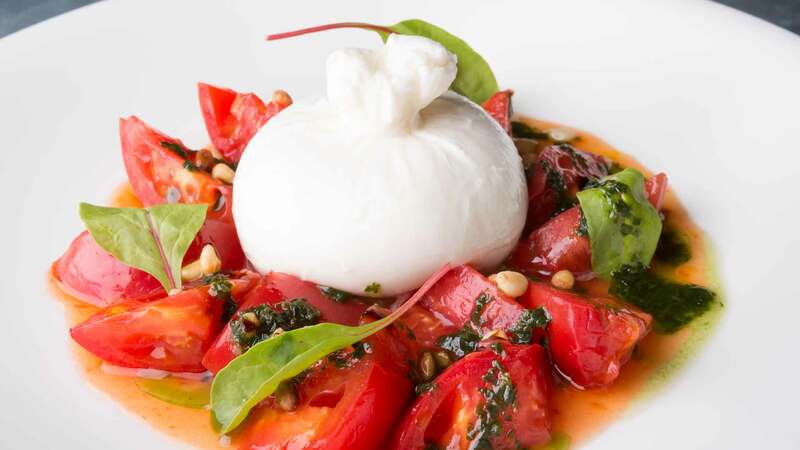 AURA will provide vegetarian, vegan, gluten-free, nut-free, Kosher, and Halal options to all guests. A full bar is open to all guests, in addition to a wide selection of coffees, teas, sodas, and juices. 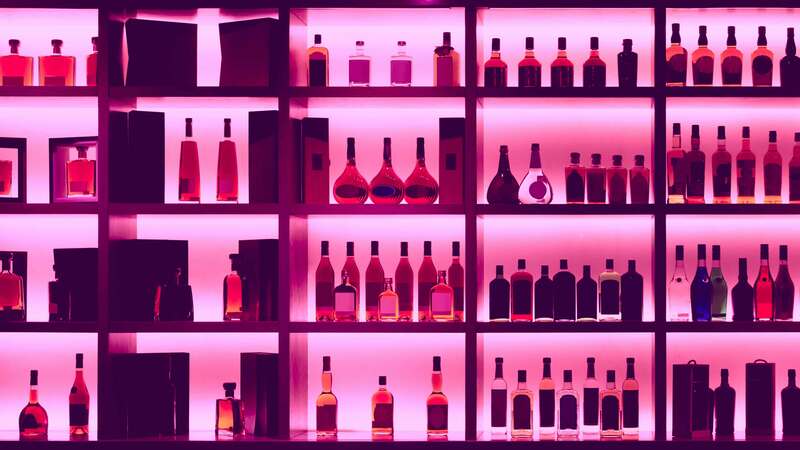 Champagne, prosecco, and port, among other top-shelf spirits, are available to all guests. All guests have free access to high-speed Wi-Fi. Stream all your favorites on Netflix, Hulu, Spotify, and others. In addition to streaming directly to your personal device, each passenger will be provided an iPad Pro. Complementary SkyLights Virtual Reality headsets will also be provided to all guests. Q: What can I watch in Virtual Reality? Escape to your own private movie theater and enjoy the latest blockbusters, trending series and documentaries in 3D, 2D and 180° on a full HD, IMAX-style screen. 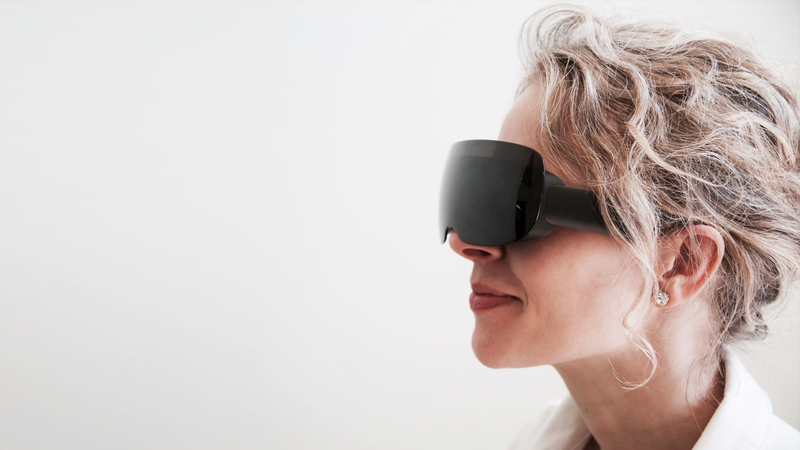 Brought to you by SkyLights, the Allosky Cinematic VR headset is the most advanced of its kind. 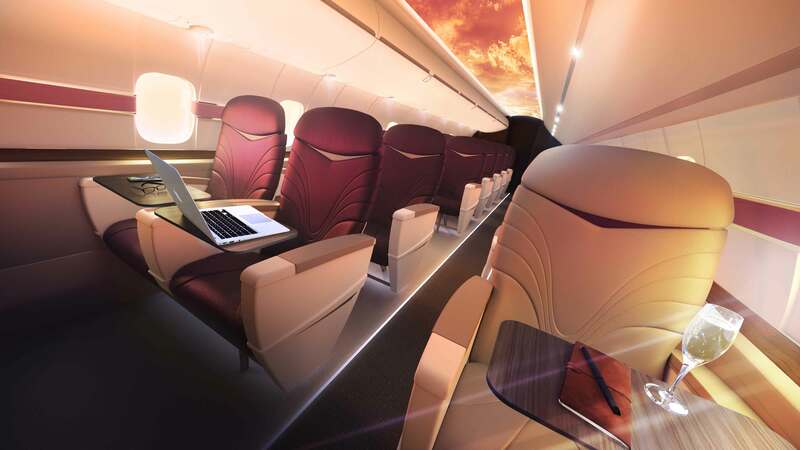 Its sleek design is tailored towards comfort and a fully immersive viewing experience inflight. Just sit back, relax and escape to another world in this truly time warping experience. Options include a catalog by 20th Century Fox, DreamWorks, Warner Brothers, Lionsgate, National Geographic, BBC, Baobab, and more. Q: How many lavatories are onboard? Two- One forward, one aft. Each lavatory is equipped with ten ultraviolet sensors which zap the surface of the lavatory killing 99% of bacteria after every use.